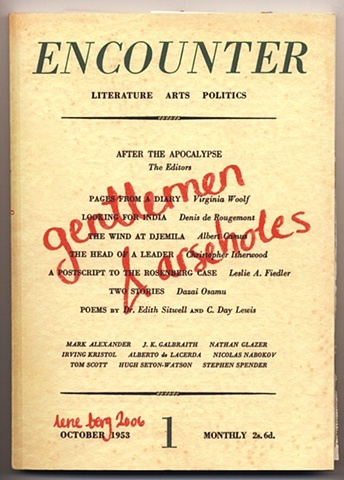 "Encounter - Gentlemen & Arseholes" deals with a cultural conspiracy from the Cold War. Lene Berg was born in Oslo, Norway and is now living in Berlin. She works with video and installations, photography and text. Her work is characterised by a mix of mediums and fictions within the one project, using so-called real persons and events as source material. Inspired by Hippolyte Bayard’s 1840 photograph Le Noyé (The Drowned), Berg explores the paradoxes in which lens-based images are read and interpreted, examining the form and truth of the photographic document. Bayard’s portrait of himself as a drowned man surfaced at the time Louis Daguerre had achieved recognition for his ‘Daguerreotype’, and Bayard’s note on the reverse side of the photograph told an invented, tragic story of the photographer’s demise resulting from his lack of recognised achievement. Berg’s The Drowned One (2008) consists of a video, a series of photographs and a book, taking its point of departure from this staged image and exploring concepts of ‘reality’ and ‘authenticity’.